Report on Research Compliance (RRC) is the #1 source of timely news and business strategies to help colleges, universities and other non-federal entities avoid the negative publicity, financial setbacks, and management problems that research compliance requirements can create. 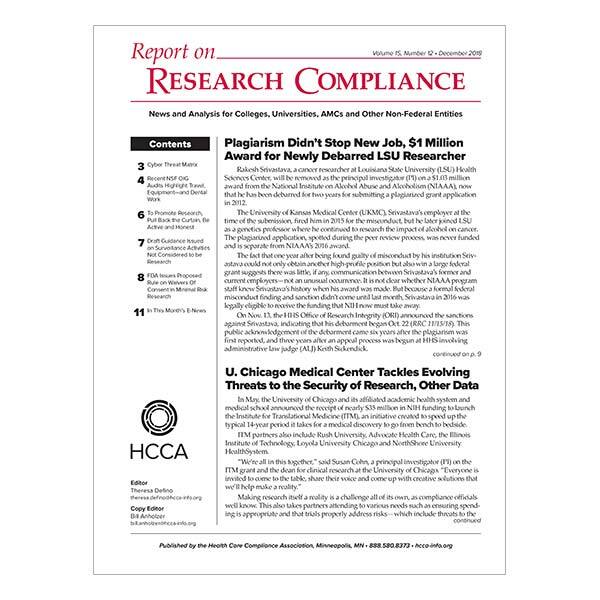 RRC also includes a weekly emailed update covering the latest research compliance news. Theresa is well-versed in the ethical and compliance issues facing researchers and institutions, having worked for an academic medical center affiliated with a major midwestern university and having written hundreds of articles based on research studies. A veteran health care journalist and writer, Theresa has been based in Washington, D.C., since 1989.